The Sangh has invited Pranab Mukherjee, former President with deep Congress roots, to its important annual event in Nagpur. 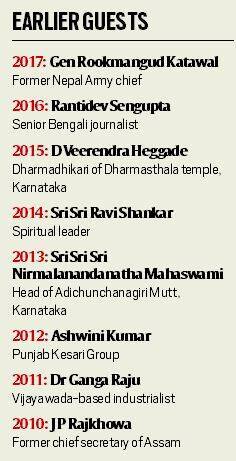 What is the Sangh Shiksha Varg, and who have been chief guests earlier? 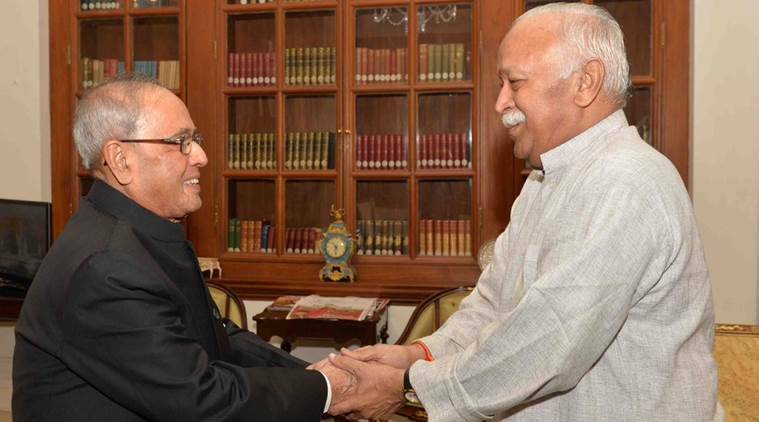 Former president Pranab Mukherjee and Mohan Bhagwat. The event to which the RSS has invited former President Pranab Mukherjee, Sangh Shiksha Varg, is an annual training camp, meant for recruits in their third year in the organisation, although some can also attend it later. Mukherjee, a veteran of the Congress before he became President in 2012, has been invited as chief guest. The RSS holds training camps for first-, second- and third-year swayamsewaks. The first-year camp, for beginners, is a 20-day event held in each of the 42 state units (prants). Earlier, most newcomers could attend these camps but the growth of the RSS since the BJP came to power has led to conditions being introduced; the list is scrutinised at district level before being cleared. The second-year camp, again of 20 days, is organised at the level of kshetra, with each kshetra comprising a number of prants. The RSS has 11 kshetras. The third-year camp, to which Mukherjee has been invited, is always held on the Smruti Mandir premises at the RSS headquarters in Nagpur; the RSS makes it imperative for every worker who has reached a certain level to visit the organisation’s birthplace. It is a 25-day event, having initially started as one of 40 days before successive reductions. In 2017, 5,716 swayamsewaks attended first-year camps, 3,796 attended second-year camps and 899 attended the third-year camp. Participants travel at their own cost, and pay fees. The trainers of camps at all three levels must themselves have been trained up to the third year. These camps are for age group 18-45; those over 45 years are trained in special camps. The third-year camp was started by RSS founder K B Hedgewar in 1927, the third year of the organisation. It is one of the two most important annual RSS events, the other being Vijayadashami Utsav or foundation day. It used to be called officers’ training camp (OTC) until the second RSS Sarsanghchalak, M S Golwalkar, renamed it as Sangh Shiksha Varg. Until a few years ago, anyone who had completed two years of training was eligible to join the Nagpur camp. But over the past few years, the RSS has limited the large number of participants to manage the camp better. It has introduced requirements such as having worked in a responsible position in prants for at least two years, and having the willingness to take up future responsibilities. The 25-day camp is during April-May, high summer in Nagpur with temperatures often touching 45°C. Training is rigorous and the routine strict: swayamsewaks have to rise at 4 am and go to bed at 10.30 pm, with just one break — about an hour after lunch. Normally, they take physical training for two hours in the morning and another two hours in the evening. The physical training includes various drills, unarmed combat including in judo, karate and dandayuddha (stick fight). The daily programme also includes two meetings among different groups based on age, education, field of work etc, and a joint session for participants, called bauddhik. The Mukhya Shikshak conducts and coordinates physical activities. The Sharirik Pramukh prepares the physical activity programme with the Mukhya Shikshak, while the Bauddhuk Pramukh prepares the intellectual programme. The camp is headed by the Paalak, while there are trainers for various activities. Normally, senior RSS leaders come to attend the bauddhiks and stay a day or two. The Sarsanghchalak does not normally visit first-year camps, considering their large number. Senior leaders visiting the third-year camp deliver lectures in Hindi on various subjects. The camps also lay emphasis on cultural assimilation with participants from various regions being encouraged to mix together. The valedictory programme is presided over by a well known personality from any field. The chief guest delivers his speech on the concluding day. The programme ends with an address by the Sarsanghchalak. The RSS has been known to invite people not ascribing to its ideology. One of the earliest examples was former Central Provinces Home Minister Sir Moropant Joshi in 1933, during Hedgewar’s time. The RSS often refers to a voluntary visit to the Wardha RSS camp by Mahatma Gandhi on December 25, 1934. In 2007, former Air Chief Marshal A Y Tipnis was invited to the Nagpur camp by then Sarsanghchalak K S Sudarshan. Without targeting the RSS directly, Tipnis delivered a veiled critique that dwelt on secularism, tolerance and faith in the Constitution, leading to a point-by-point rebuttal by Sudarshan. Before that, Gandhian health activist Abhay Bang had once been chief guest. Others former chief guests include former CBI chief Joginder Singh, Republican Party of India (Gavai) president R S Gavai, and former Nepal Army chief Rookmangud Katawal.